How one 45-year-old runner shaved an hour from her time to finally qualify for the Boston Marathon. I’ve wanted to run the Boston Marathon since before I even started running, thanks to four years of enthusiastic hollering as part of Wellesley College’s famed Scream Tunnel. My senior year—1996—coincided with the race’s 100th birthday, when event organizers chose to mark the milestone by allowing nearly 40,000 people to take part. I considered running it for about a second, but my real passion at the time was rowing, and the spring racing season on the Charles River won out. Little did I know it would take me 23 years and nine marathons to finally earn a place in the pack. Two weeks out from the 2019 Boston Marathon, I’m tapering, which means I have time on my hands to reflect on the many, many miles I’ve traveled en route to the starting line. Qualifying for Boston is hard—and it should be. But it is doable, even for a middle-aged woman with no real running talent to speak of. “If you want to find out what you’re truly capable of, and you don’t put limits on yourself, you can qualify for Boston,” says Ann Restak, a New York-based running coach and cohost of the “Chill Track Friday” podcast, who—like me—has taken a little more than an hour off her first marathon time. For many runners (myself included), Boston is the Holy Grail. I will never compete in the Olympics, and I probably won’t ever break the tape in a marathon, either, so just starting the race feels like a towering achievement. 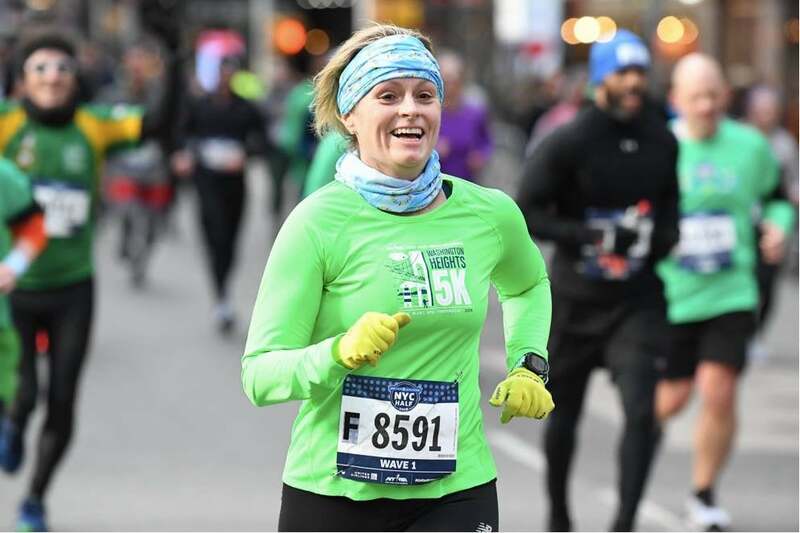 Christine Burke, a Boston veteran who is vice president of strategic partnerships and runner products at NYRR, understands the road to qualification is often full of twists. I took my first steps toward Boston with Team in Training at the 2001 Dublin Marathon. As a recently retired college athlete, I figured I was already in decent shape. Having never run more than about five miles at a go, I kicked things off with eight miles, and it didn’t take long for my untrained legs to develop stress fractures (marathon lesson No. 1: It takes a lot more than just stamina to run 26.2 miles). But I healed, and finished in 4:43:16. In the final 5K, I passed a guy in a Gumby costume, which felt like a huge victory. For the next seven years, I watched the New York City Marathon from my apartment on First Avenue, at about the 17.5-mile point. In 2008, I joined the pack, eager to see if I could go faster than I had in Dublin. And although I was severely undertrained, I did: 4:06:30. At the time, a 3:45 marathon would have qualified me for Boston—but I still didn’t get how hard it would be. In 2010, I set my sights on a BQ. Experienced runners told me I needed to find a flat course, so I ran London in 2011 (4:05:22—which was actually two PRs if you count my stupidly fast first 10K. Marathon lesson No. 2: Running a 10K PR off the line is not the way to get to Boston, but it is a great way to learn the positive power of negative splits). A few weeks later, I used my leftover marathon fitness to set PRs at 5K, 10K (on purpose this time), and the half marathon. Each new benchmark suggested that a 3:45 marathon was entirely within reach—except for the fact that running a good marathon is really, really hard. I went to the Chicago Marathon in the fall, and on a warm day, fell short again (3:58:58). Throughout 2012 and 2013, I logged thousands of miles. I figured out that energy gels combined with electrolyte drinks wreak havoc on my stomach. I started doing weekly track workouts: 800-meter and mile repeats, plus long runs of up to 22 miles. Annual trips to Chicago became routine, and so did disappointment: 3:54:30, 3:52:23… Dozens of friends qualified for and ran Boston, and I watched from the sidewalk. In 2013, I cheered and clapped as hundreds of runners arrived in Copley Square a little less than four hours after they’d left Hopkinton. Some were older than I was, some were bigger, some even wore cotton socks. The only significant difference between us was that those tough athletes were all a few minutes faster than I was. Determined and inspired to join Club 3:45 one day, I left Boylston Street about nine minutes before the first bomb went off. I was still badly shaken when I lined up in London six days later, and the combination of stress, jet lag, and a pesky manhole cover that sent me sprawling at mile 25 led to yet another disappointing finish (3:59:44—though I’m still extremely proud that I made it home in under four hours, despite my spectacular faceplant). Finally, I caught a break—several, actually. The summer of 2014 was relatively temperate, and I executed every single workout in my online training plan to the letter. Sunday, October 12 was cool and sunny, and several girlfriends flew to Chicago to cheer me on. The stars aligned, and I ran into Grant Park in 3:43:04—then promptly burst into tears of joy. I’d finally get to run Boston in 2016. I couldn’t have known then that my 1:56 cushion wasn’t enough, thanks to the B.A.A.’s rolling registration process. Eleven months later, I was crushed to learn that I was among the 4,562 disappointed runners who got shut out of the race. I lay awake at night agonizing over the 32 seconds that kept me out of the race. Were they the result of a water-station tangle, or maybe an ill-timed gel? I’d planned my life around not running a marathon in 2015, and I’d also gotten far too smart to try to run a half-baked revenge race. As if all that wasn’t enough, I lost my job, endured a painful breakup, and then tore a tendon in my left foot—so no marathon in 2016, either. When I finally got back to training in 2017, I decided to try a slightly different approach. Instead of flying off to run yet another big-city race (the only kind I’d ever run), I targeted the Hamptons Marathon on Long Island, which is close to home and flat—it would have been fast, too, until the temperature crept into the upper 80s. Naturally, I wanted to smash the qualifying standard—and it became clear as the race wore on that the only things I’d smash if I tried to run that pace in the extreme heat would be my kidneys. So I dropped out a little past halfway, and maintained my fitness for another three weeks until I could find another race to run. And in the meantime, the qualifying window for the 2018 Boston marathon closed—which turned out to be a blessing in more ways than one. For starters, I’d be in a new age group—with a 10-minute cushion—for the 2019 race. In beautiful downtown Hartford, Connecticut, I did smash the standard, and though I wouldn’t call a 14-second PR “smashing,” I’m thrilled to have run 3:42:50. And then, of course, there was last year’s terrible, horrible, awful, miserable weather. My running buddies and I stood at the corner of Commonwealth Avenue and Hereford Street—arguably the world’s most famous right turn—and shivered all day. Fast-forward to late March, 2019—the end of my Boston training block. It’s gone well. I sucked it up and ran a whole bunch of 800s. I hammered every hill in Central Park, over and over and over again. 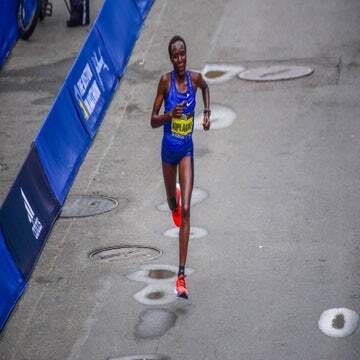 I tuned up at the NYC Half, and then went up to Boston to train on the course. I already knew the dangers of going out too fast, but now that I’ve seen the first 5K and conquered Heartbreak Hill, I feel like I’ve done everything I can to prepare for the race. All kinds of pace tables suggest that I’m in PR shape—but if I’ve learned anything at all through this journey, it’s that there are no guarantees in the marathon. 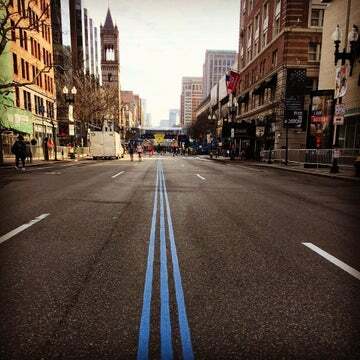 Whatever happens this Patriot’s Day, one thing is certain: I will cry like a baby all the way down Boylston Street.